For cakes that cannot withstand being flipped upside-down for pan removal, a spring form pan is a necessity. 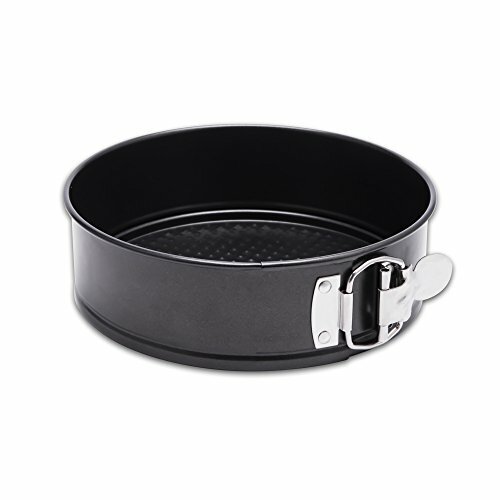 Once the spring hinge is closed, the pan creates a leak-proof interior preventing any better from escaping the pan, while the honeycomb texture on the base ensures even and quick heat flow to the cake, which makes the layers of the cake consistently baked without any over or undercooked parts. The latching side panel detaches easily for quick and safe removal of your delicate cheesecake or streusel-heavy coffee cake. A nonstick coating seals the deal, providing easy release and hassle-free cleanup. SAFE AND NON-TOXIC: This pan is PFOA, BPA, and PTFE free and reflects our commitment to safe cookware for both you and the environment. Cook well. Do good. USE AND CARE: Before using your new bakeware for the first time, wash all pieces in the set in warm, soapy water, rinse, and dry. For best results, the non-stick surface should be "conditioned" by wiping the interior of the pan with a light coating of cooking oil. Use only nylon or wooden utensils for non-stick bakeware. Never cut or chop in any of these pieces with a metal utensil, as it will cut into the non-stick surface. HIWARE has been a trusted and reliable brand in professional kitchens for over 20 years. Our commercial lines of products, ranging from tabletop to kitchen utensils to food preparation supplies, are used by all foodservice and hospitality industry experts worldwide. While our products are made to meet the high demands of a restaurant kitchen, we are excited to now make them available for the serious home chef.